Steve Labaton of the New York Times reported that senior regulators at the Federal Deposit Insurance Corporation (FDIC) are seriously considering a plan to have the nation's "healthy banks" loan money to the government to replenish the FDIC insurance fund that protects bank depositors. Read more about Banks to Bailout Government? Likening the actions of the federal Securities and Exchange Commission (SEC) to those of Oscar Wilde's famous cynic "who knows the price of everything and the value of nothing," New York Federal Judge Jed Rakoff tossed an SEC settlement with Bank of America (BofA) out of court yesterday and ordered the parties to ready for trial. Cigarette makers have come up with a way to get around the new U.S. Food and Drug Administration (FDA) rule banning flavored cigarettes. On What Planet Does the Chamber Design Its Ads? To "move the spotlight off the unpopular commercial banks and mortgage lenders that are the target of the legislation," the U.S. Chamber of Commerce is claiming that the proposed Consumer Financial Protection Agency will hurt butchers. "The economy has made it tough on this local butcher's customers," reads the Chamber's latest ad. Read more about On What Planet Does the Chamber Design Its Ads? Bank Looting Bonuses Reported--Will the SEC Awake from Its Slumber? A short time ago, New York Attorney General Andrew Cuomo released a report focusing on the bank bonuses paid out by the biggest banks in 2008, the same year they were bailed out by federal taxpayers. The report notes that in many instances the bank bonuses exceeded bank profits, the implication being that taxpayer dollars were being used to subsidize the salaries of the ace banking executives who created the financial crisis in the first place. Read more about Bank Looting Bonuses Reported--Will the SEC Awake from Its Slumber? Is Obama Planning to Sign Congress' Health Care Reform Bill with Lipstick? Over the coming weeks, Americans will find out whether the man they elected their president is just a great orator and politician or whether he is also a great leader. Of the central features of candidate Barack Obama's health care proposal, he said one thing was essential -- a public insurance option to compete with the private insurance industry that is now dominated by a cartel of Wall Street-driven, for-profit behemoths. Another thing Obama said he would not support -- a requirement that all of us be forced by law to buy overpriced health coverage from private insurance companies. Many of the people who voted for Obama did so because they believed his health care proposal was the best among the field of Democratic candidates and -- no contest here -- far better than the insurance industry-backed plans advocated by the Republicans. Obama was not alone in calling for a public insurance option. So did Hillary Clinton, among others. About the only thing that distinguished Obama's plan from Clinton's, in fact, was his opposition to forcing all of us to buy health insurance. "Why should we force people to buy something they can't afford?" he asked repeatedly on the campaign trail. After listening to the speeches he made in Montana and Arizona and to comments made by Health and Human Services Secretary Kathleen Sebelius and Obama's press secretary, Robert Gibbs, on the Sunday morning talk shows, I'm wondering what happened to the guy Americans elected. Read more about Is Obama Planning to Sign Congress' Health Care Reform Bill with Lipstick? Lobbyists will often argue that a major reason clients hire them is because of their deep personal connections with decision makers. Steve Elmendorf, who founded Elmendorf Strategies in 2007, was an adviser to various Democratic Party campaigns and politicians for over 25 years. So his connections with Democratic Party movers and shakers seem beyond dispute. The Obama administration's Cash for Clunkers program rewards consumers for buying more fuel-efficient cars to replace older models, which benefits the auto industry through increased sales. But the program also mandates that the "clunkers" that are traded in be destroyed, creating a large amount of toxic waste to be handled. $23.7 Trillion Bailout - Will Justice Shoot the Messenger? Neil Barofsky, Special Inspector General of the Troubled Asset Relief Program (a.k.a. the SIGTARP ) caused quite a stir in Washington last week when he released a quarterly report that attempted to tally up the total dollar amount of federal government commitments related to the bailout. Those commitments include federal government programs that spend taxpayer money or issue loan guarantees in an attempt to rescue financial services institutions and support the economy. While the administration and the media have focused on the $700 billion in bailout funds explicitly authorized by Congress, Barofsky tried to bring a little transparency to the complex array of federal programs including those of the Treasury and the opaque Federal Reserve. His report put the potential outlay of taxpayer dollars of the combined 50-plus programs at an astonishing $23.7 trillion. Read more about $23.7 Trillion Bailout - Will Justice Shoot the Messenger? 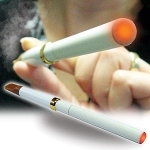 Their websites have names like SmokeAnywhere.com and SmokingEverywhere.com, and manufacturers of electronic cigarettes, or e-cigarettes, are touting that their products are "cheaper than a cigarette," have a "cool design," come in "different flavors" and are a "tar-free option" to traditional cigarettes.